CINCINNATI — Ryan Braun hit a tiebreaking double and Travis Shaw ended his deep slump with a two-run homer Tuesday night, powering Milwaukee to a 7-6 victory over the Cincinnati Reds in another resurgent night for the Brewers’ struggling offense. Braun’s two-run double off Homer Bailey (0-4) put the Brewers ahead to stay 5-3 in the fifth inning, Milwaukee’s second straight game with at least six runs. The Reds have lost all of Bailey’s seven starts this season. Shaw snapped an 0-for-19 slump with a two-run homer. Jesus Aguilar and Hernan Perez added solo shots, giving Milwaukee five homers in the series. Chase Anderson (3-2) overcame a rough opening inning to get his third win in his last four starts. Jeremy Jeffress preserved the 7-6 lead in the eighth, pitching out of a two-on threat by fanning Joey Votto and retiring Scott Schebler on a grounder. Jeffress finished for his first save since 2016. 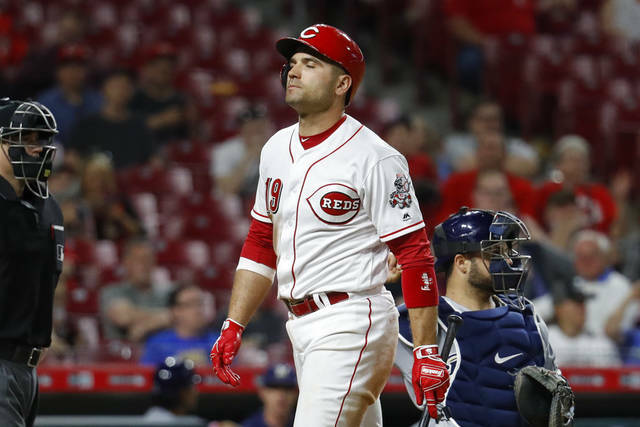 Eugenio Suarez led the Reds with a two-run homer and a sacrifice fly. In six games back from a broken thumb, Suarez is batting .360 with three doubles, 10 RBIs and a homer. The Reds fell to 7-23, matching the 1931 and 1934 teams for worst 30-game start in franchise history. Milwaukee made a move to add a position player temporarily, calling up OF Brett Phillips from Triple-A Colorado Springs and optioning RH reliever Brandon Woodruff. Brewers: RH Corey Knebel will start a rehab assignment Thursday and make three or four appearances. He’s been sidelined by a strained left hamstring since April 6. Reds: An MRI on Scooter Gennett’s sore throwing shoulder found no significant injury. He was out of the lineup for a second straight day, but pinch hit and grounded out. Brewers: LH Wade Miley will be activated and make his Milwaukee debut. He signed a minor league deal on Feb. 16 and suffered a strained groin while fielding a bunt on March 21. When added to the 40-man roster, he’ll get a one-year deal with a salary of $2.5 million while in the majors and the chance to earn up to $3.2 million in performance bonuses. Reds: Luis Castillo (1-3) is coming off his worst career start. He gave up five runs while pitching into just the second inning last Friday at Minnesota.